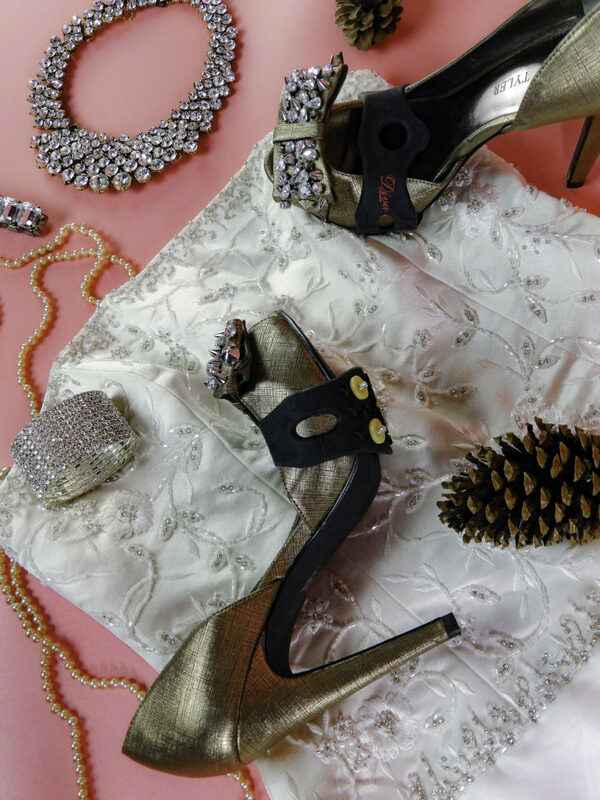 It’s that time of year where there are lots of parties and events that one might wear a stiletto or other dressy heels, and lots of snow and ice, rain, and sleet which one might slip and fall, not to mention damage a perfectly good set of heels. Why ruin the look of an outfit with sensible shoes? 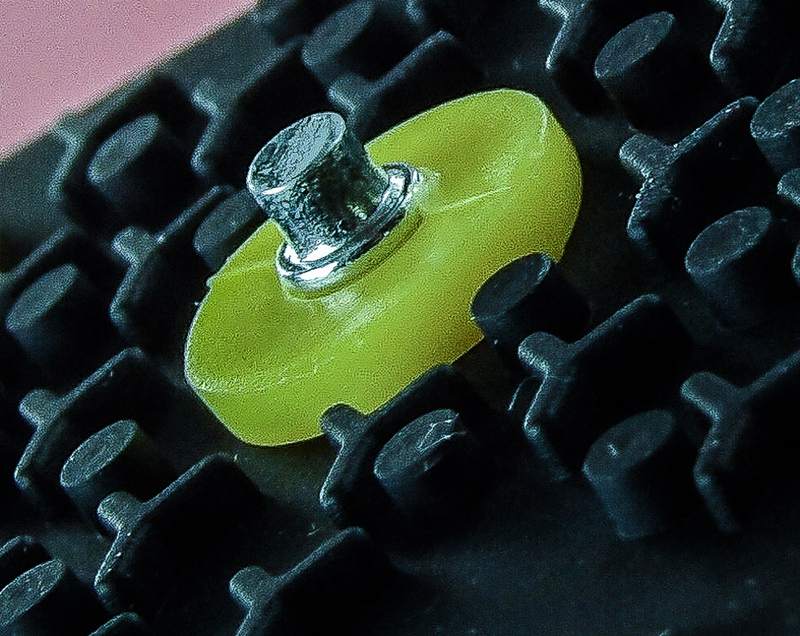 OVERVIEW: A slip-on cleat that fits any type of shoe without causing damage or scratches to the shoe, and enables safe walking on slick, icy surfaces such as wet pavement, stairs, sidewalks or directly on ice or snow. Here in New England, the weather changes constantly. On a perfectly sunny morning, it starts snowing while you are at work, and when it is time to walk to your car at the end of the day, the ground is covered with slick snow or ice. Your choices are gingerly walk to your car in your heels or take them off and walk barefoot. Neither choice is safe or appealing, not to mention that snow and ice can damage shoes. Sometimes you know it is snowing or going to snow, but you have already planned the perfect outfit with the perfect shoe. You don’t want to wear snowshoes or snowboots into a party, interview or work and have to change into your dress shoes in the lobby and then have to carry your soggy snowshoes around with you. Or you may get stranded and need to walk through the snow and ice. You may have snowshoes with decent treads, but the weather outside is so treacherous that you want extra traction, such as when you have to shovel out your car or walk your dog during or after a big snowstorm. For all of these circumstances, there is DivaCleats. 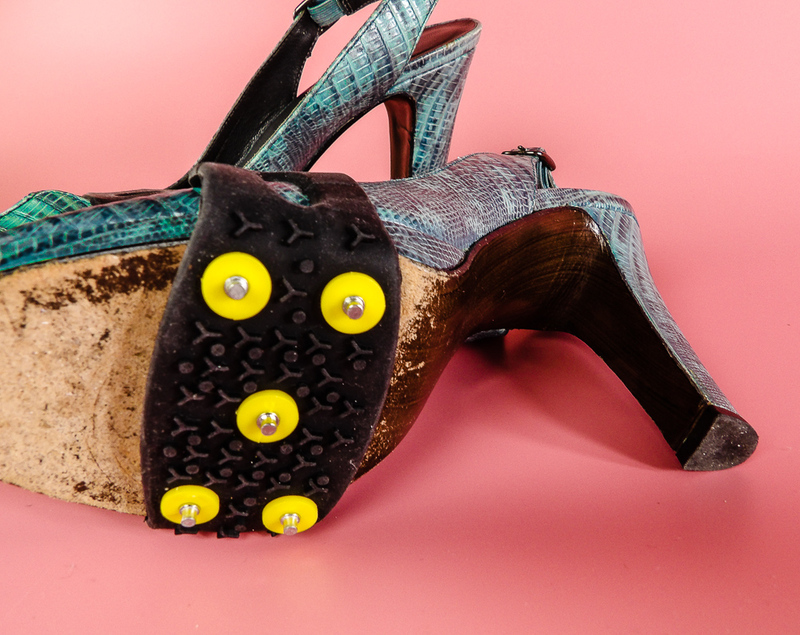 DivaCleats slip over a dress heel shoe to provide traction and grip even on ice. There is no need to risk a slip and fall or shoe damage when DivaCleats can keep you and your shoes safe. 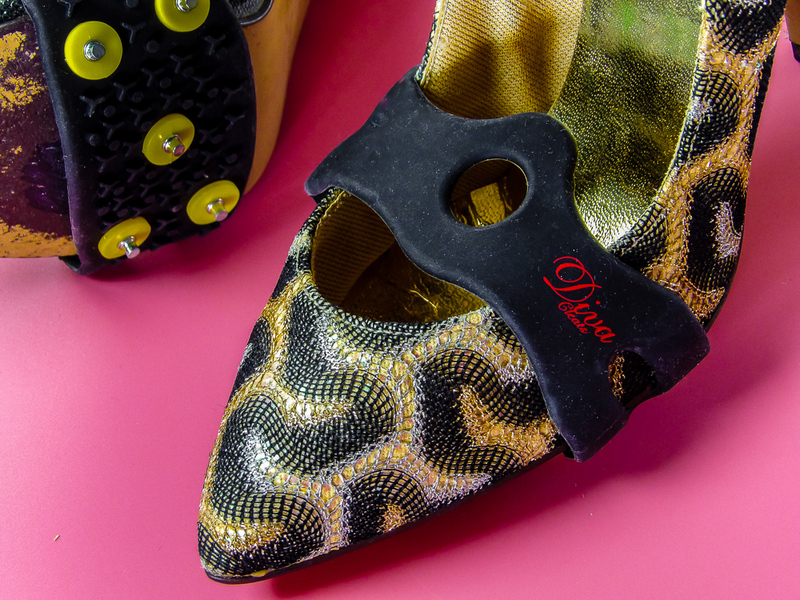 DivaCleats slip over the front of the toe and rest near the vamp area, providing a safe way to step onto snow and ice regardless of the height of the heel or material of the shoe sole. One size fits everyone. They fit over a stiletto heel, classic pump, a boot, an Oxford, a slingback or mule, sneakers, or even a riding boot that lacks treads or traction. 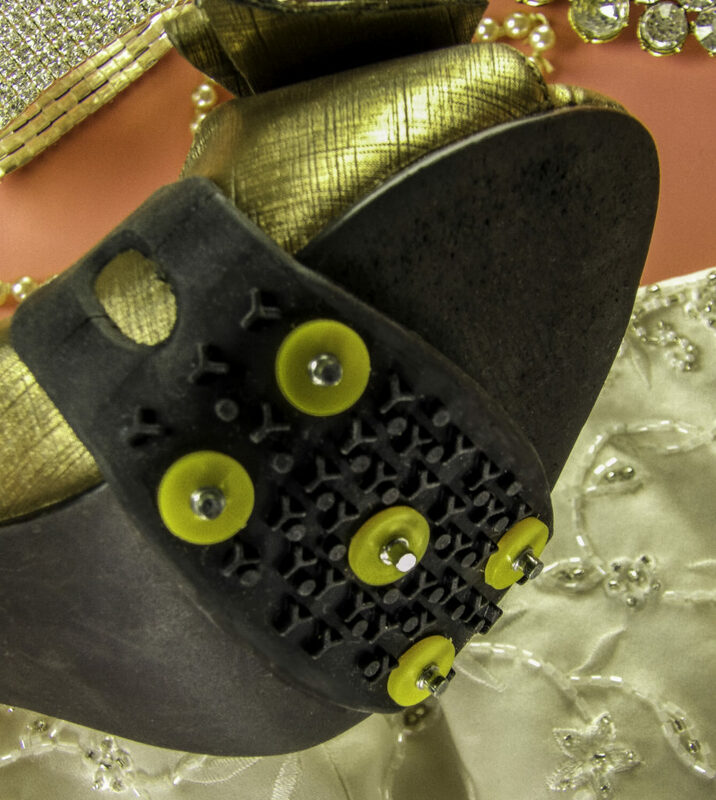 Basically, if a shoe is not intended to be worn as a means of serious traction on ice, DivaCleats can give that shoe treads to walk safely. If a shoe already has some traction, it can give your foot the equivalent of “front wheel drive”, safe footing as you step, walk and pivot on wet stairs or snowy and icy driveways. 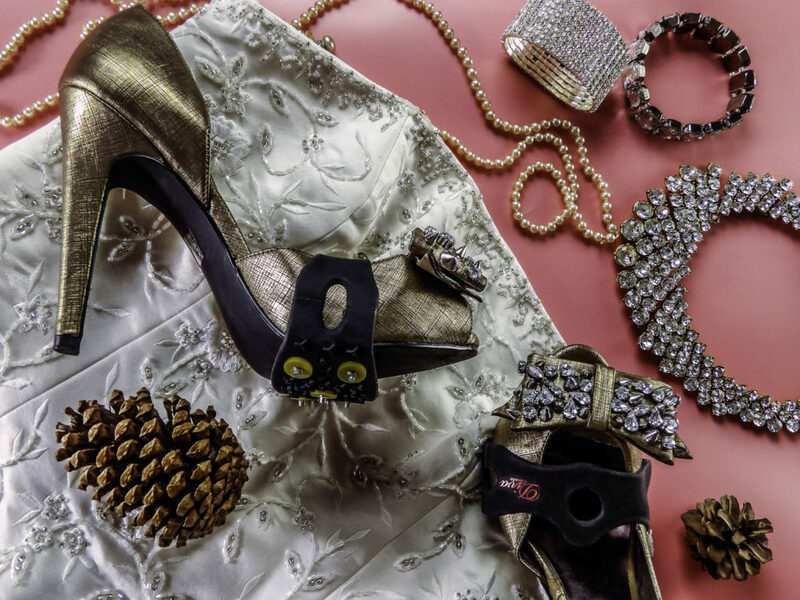 Here are some types of shoes I wore so far this winter with DivaCleats and did not experience any scuffing, scrapes, or damage to the vamp, sole or platforms of the shoes. Just slip them on and discretely walk out with them, they are easy to slip off and on many pairs of shoes, they aren’t even that noticeable when you first arrive somewhere. It is much more discrete than taking off wet boots in someone’s foyer. 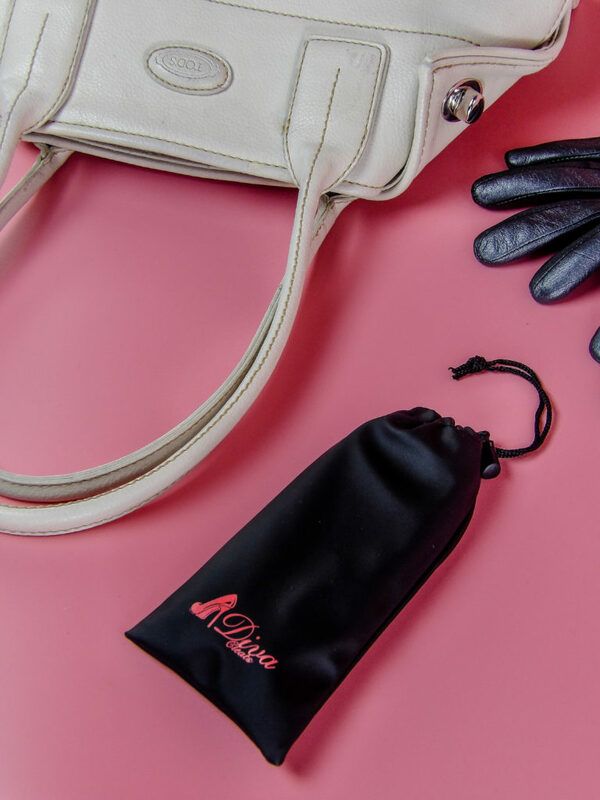 DivaCleats come with a waterproof bag so you can just pop them in your handbag whenever there is the potential of inclement weather including snow, sleet, and rain. You can also keep them in the glove compartment of your car. It snowed several days in a row, so I found the DivaCleats to be very helpful worn on my wellies and sneakers when clearing snow off my car. 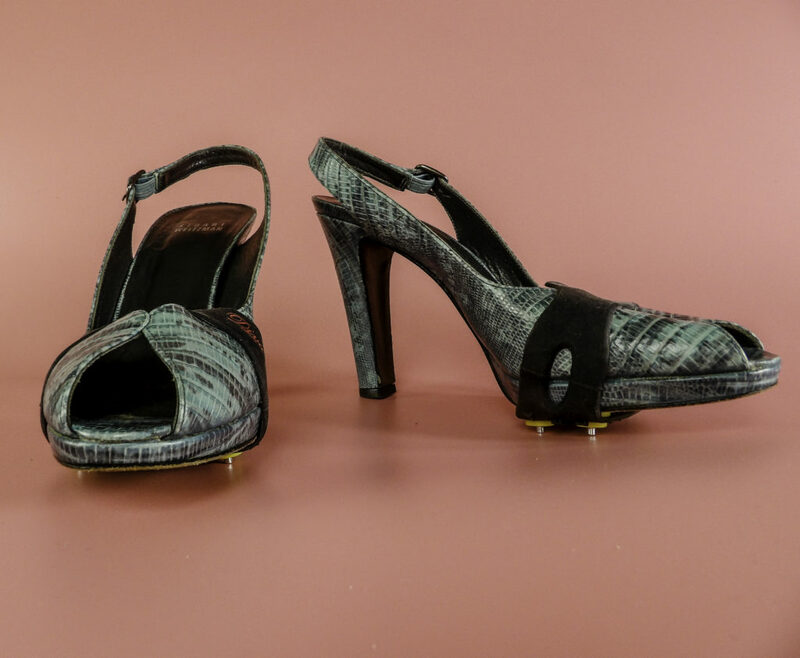 I wore them walking in a mid-heel pump with a thin heel on unexpected ice one night after work and they did not scuff or damage my shoes in any way, and it made walking in a not-so-safe shoe much easier. The tread on the DivaCleats grips even on sheets of ice that I could have easily seen myself otherwise slipping on even if wearing flats or my sneakers. I find them to be sturdy and they are convenient to slip on and off as I enter and exit the building from work, going to a restaurant, or going to someone’s house for dinner. DivaCleats didn’t crush, scratch or otherwise damage delicate leather, suede or fabric shoes, or leave indentations or scuffs. They also protect the base platform of shoes from getting excessively wet because the cleat elevates the shoe platform. 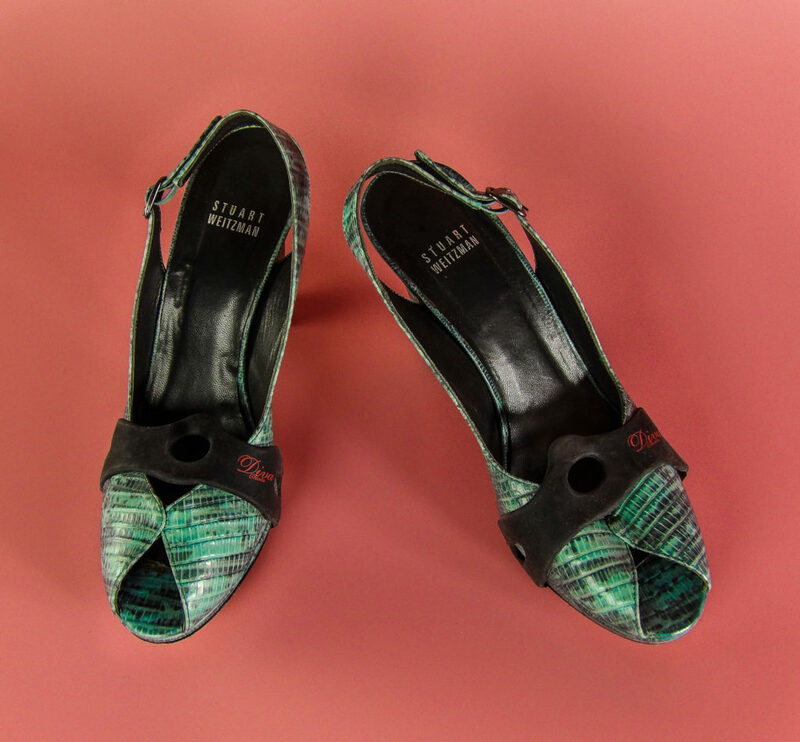 Wear the shoes of your choice regardless of the weather with DivaCleats. 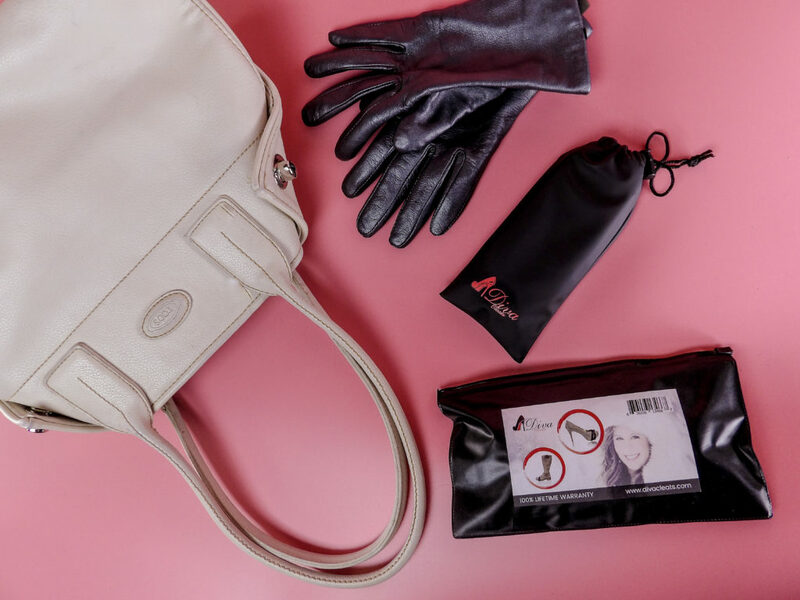 DivaCleats are portable, easy to use, work with any shoes, and come with their own waterproof bag so you can discretely wear them in and out of inclement weather. 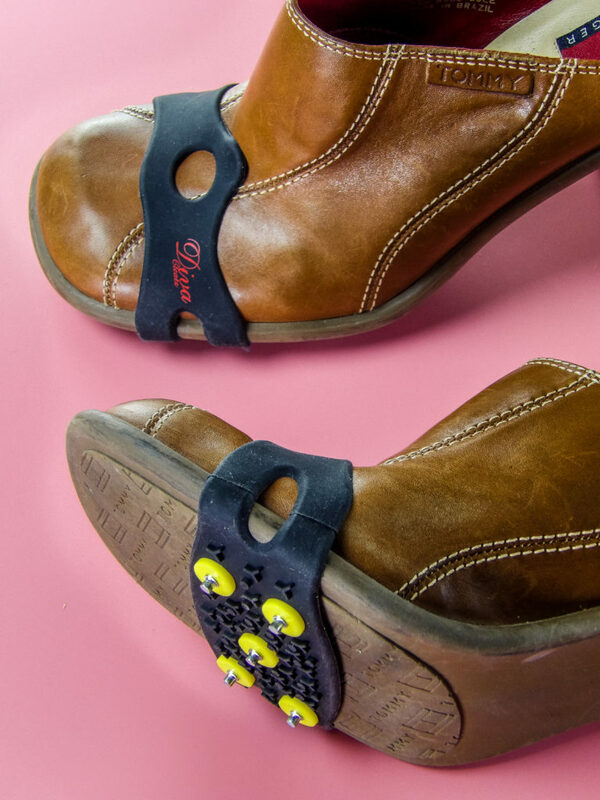 Ideal for professionals who wish to arrive looking put together, DivaCleats give any shoe the ability to be a safe shoe on wet, slick surfaces. The cleats are fire-hardened to last for years. 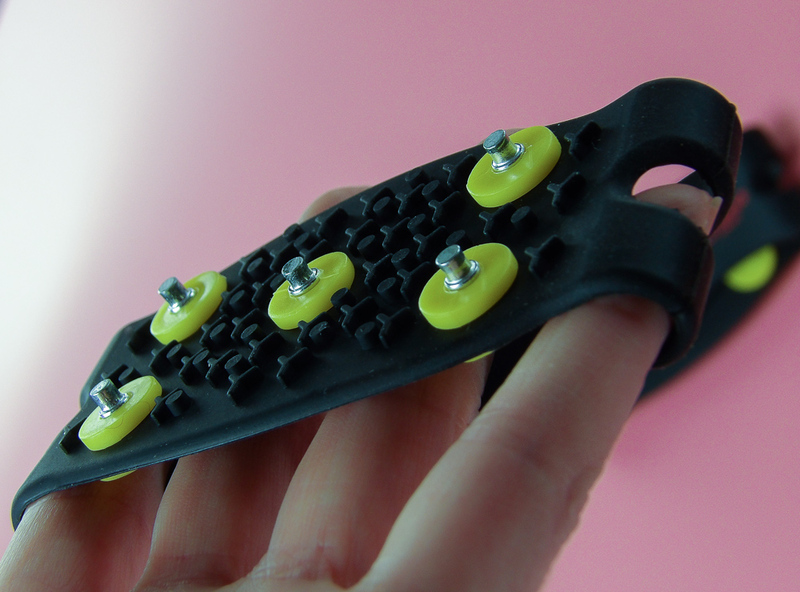 DiveCleats will not scuff or damage your shoes. 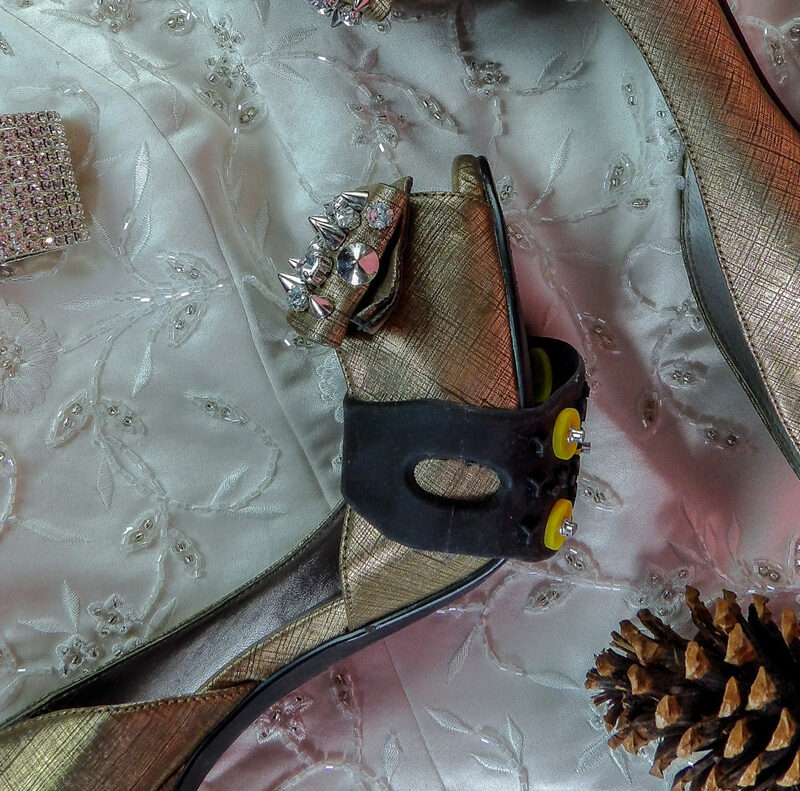 Style Chicks received DivaCleats Ice Cleats for Women’s Footwear in exchange for our unbiased review and received compensation for our time and effort. However, our experience with the product and the opinions expressed in this review are 100% ours.